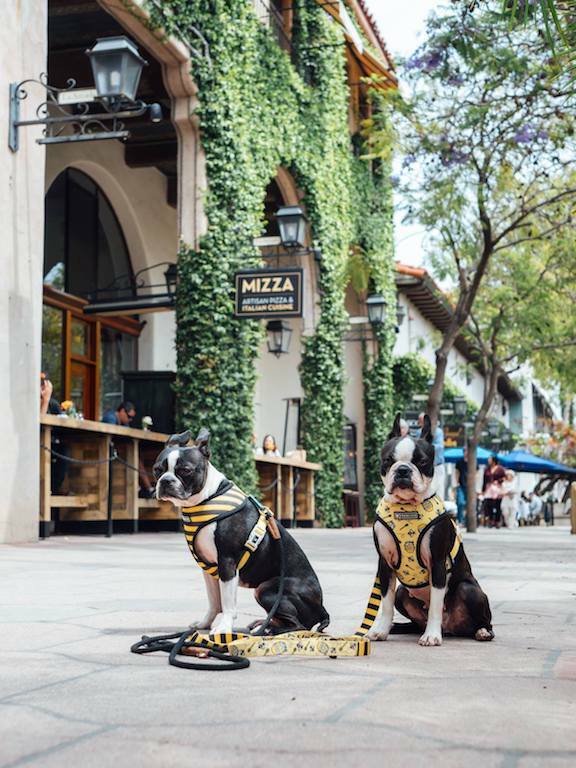 Year round mild weather, dog friendly, and it’s laid back surf culture are reasons why Santa Barbara remains at the top of our list of cities to getaway with our dogs. Santa Barbara requires little planning. If you stay at the right place you’ll find a myriad of activities to do right outside your doorstep. On a whim we decided to head out before the Memorial Weekend. We’re big fans in vacationing off peak times. Meaning outside of holiday weekends, and preferably Sunday through Thursday. The main reason is we don’t like to battle crowds when site-seeing or going out to eat at restaurants. Santa Barbara is easily accessible from San Diego, Los Angeles and San Francisco. We left our home early in the morning and arrived by noon. 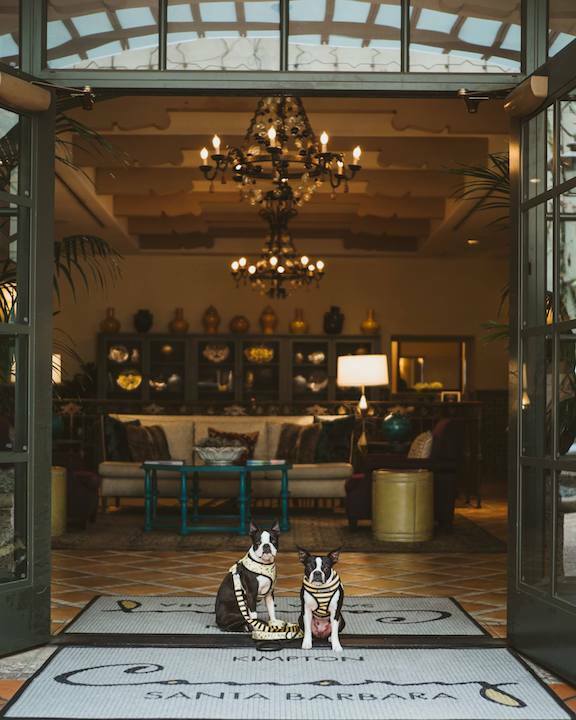 The Kimpton Hotels brand is a pioneer in creating boutique hotels. 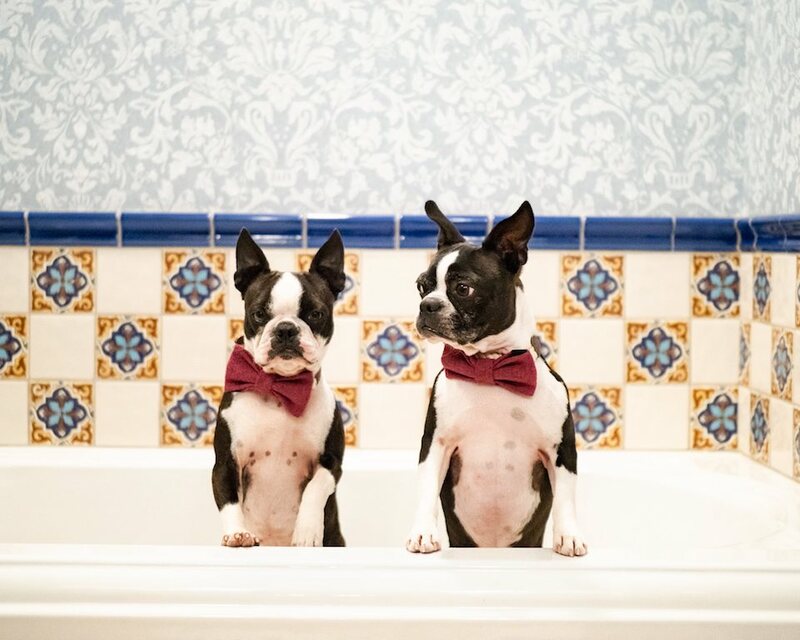 Their founder Bill Kimpton was originally an investment banker. During his early career he traveled European Hotels and noticed their flair for design. Realizing that the vacation experience, even if was for 24 hours included the experience with hotel itself, he started the Kimpton brand. From the start Bill Kimpton wanted to create something unique offering a European Flavor, good value and a sense of fun. 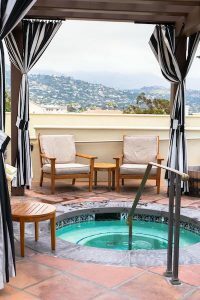 Located one block from State Street in downtown Santa Barbara is the Canary Hotel. This was our property of choice and our home base for the next 24 hours. 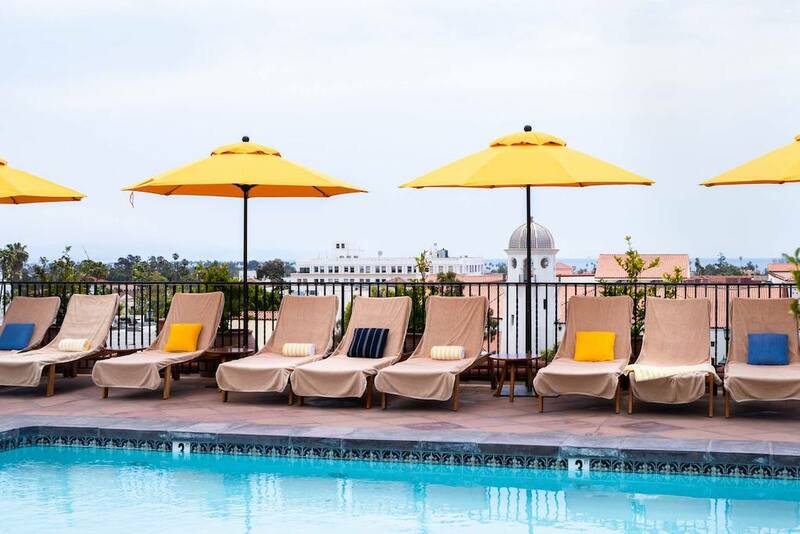 When you stay at any Kimpton property, you’ll immediately feel like you’re in another place. The Canary Hotel is no exception. It draws its inspiration from the Canary Islands, an archipelago under Spanish control of Morocco’s coast. Check in time at the Canary Hotel is 4pm. But we stopped by to let them know we were in town just in case our room would be ready prior to the 4pm time. Downtown Santa Barbara is only a block from the hotel. They had blocked State street for an antique car show. If you plan to travel and check the calendar of events ahead of time, they have it listed on the following website. It was a busy day downtown. We must have walked several blocks admiring all of the antique vehicles. Every now and then we’d visit with others who wanted to say hello to our dogs. It didn’t take too long before we got hungry. 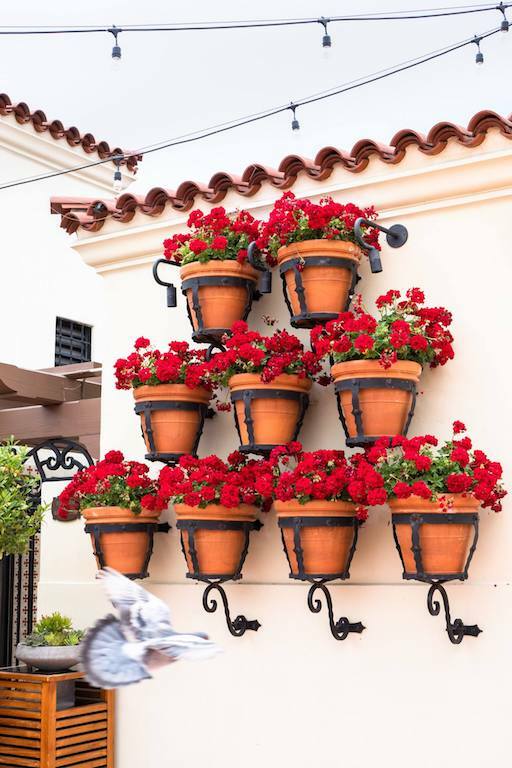 Santa Barbara is one of those towns that offer a lot of patios to dine in. And it’s a fairly safe to guess that anyone with a patio is going to be dog friendly. In a mood for a burger we walked into Eureka Restaurant to grab a bite to eat. We ate their Brussels sprouts, a burger, and fries. Towards the end of the meal, I received a text from the Canary Hotel announcing that our room was ready. I was pleasantly surprised because it was earlier than the 4pm check in time. And also happy to communicate this way. In a loud environment I could have missed the call, or not been able to hear. Receiving a text allowed me to see the message, communicate and plan accordingly. I later asked if this was a new way in reaching guests to which they replied it was newly implemented a week ago. Each member of the front desk had access to a global dashboard to communicate with guests. 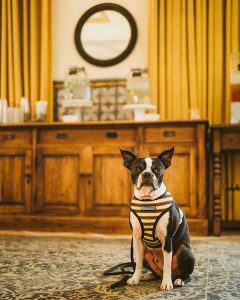 There are hotels who claim to be dog friendly. But it’s more for appearances sake. 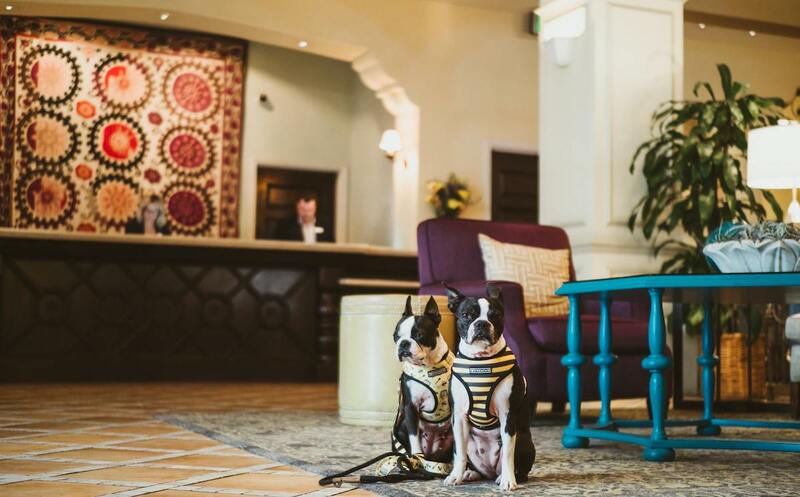 I’ve actually been to a hotel where the front desk employee was scared of dogs and there weren’t any acknowledgments to greet our dogs or give any dog friendly recommendations. That is not the case with the Canary Hotel. The front desk employees greeted us warmly. 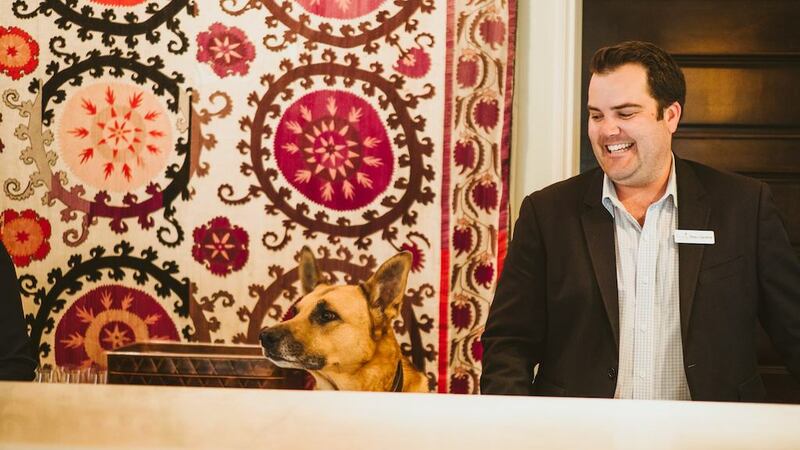 They even had a employee’s dog behind the desk. I think his name was Wild E Cayote. 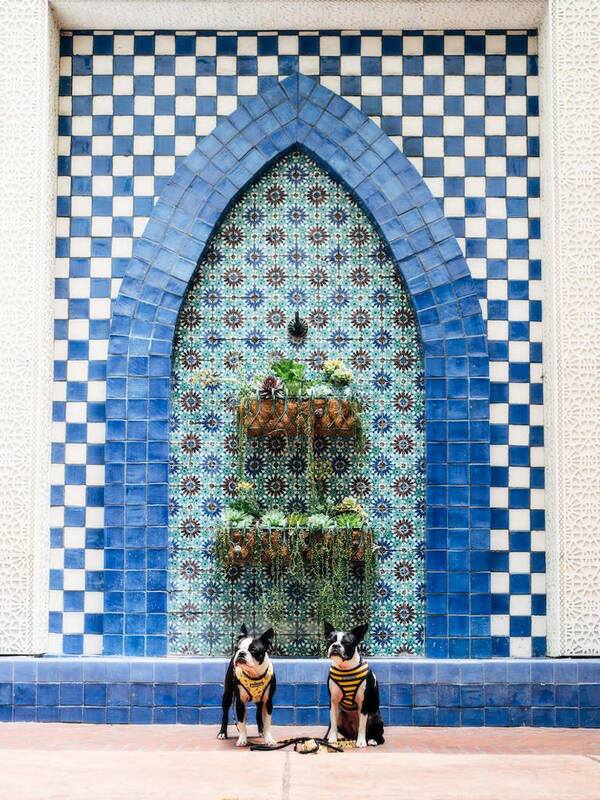 They gave us recommendations on where to eat for dinner and they greeted our dogs. 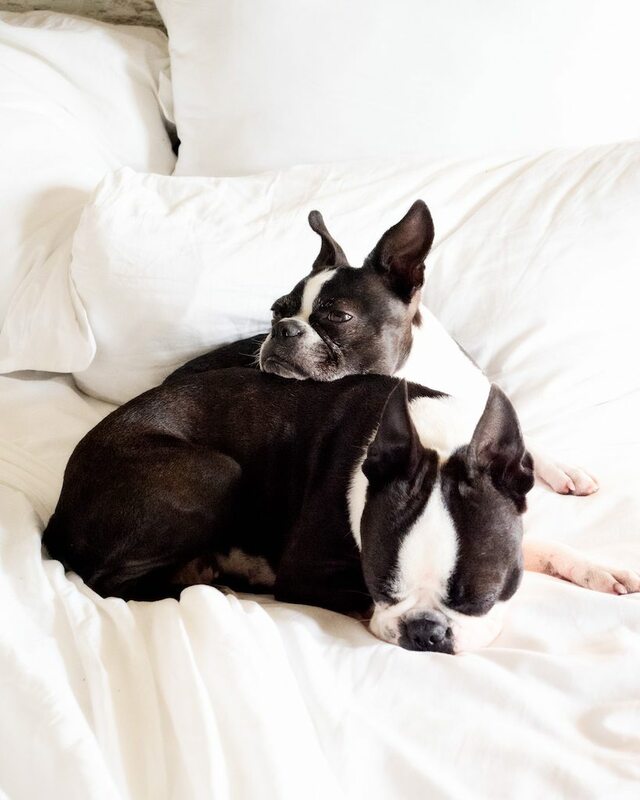 You know the way to any dog owner’s heart is through their dogs and they certainly did that. We had room number 809, on the fifth floor. It was sunny and spacious. 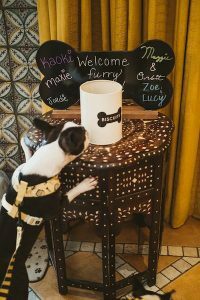 We had a dog bed, dog bowls, and a welcome amenity for Maggie. I had mentioned to them that we were celebrating Maggie’s third birthday. Our room had hard-wooden floors, a four poster bed, and a small balcony with city views. There was a small desk, large flat screen TV, in-room fridge and mini bar. The closet had luxurious robes and a yoga mat in case you wanted to do yoga. The bathroom was spacious, decorated in tile, and even had a small TV by the vanity. 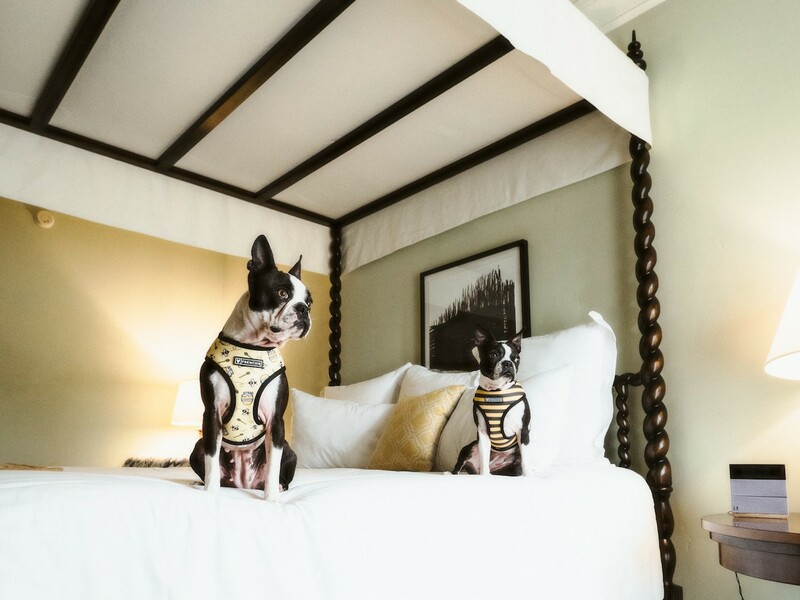 Kimpton is known for paying attention to details. Instead of your standard hotel glassware the vanity had these colorful handblown glasses. 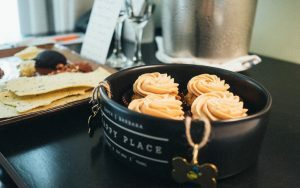 The amenities were proprietary to Kimpton but what was nice was they were full in size. A few other details I noticed … they must have had a soft water system in place. Also the hot water would instantly flow from both the vanity faucets and showers. Nothing worse than having to stand and wait for the hot water to arrive but this wasn’t the case at the Canary Hotel. Because we were loyalty members, Wi-Fi was free. We did a speed test and were pleasantly surprised that it was quite a strong signal. 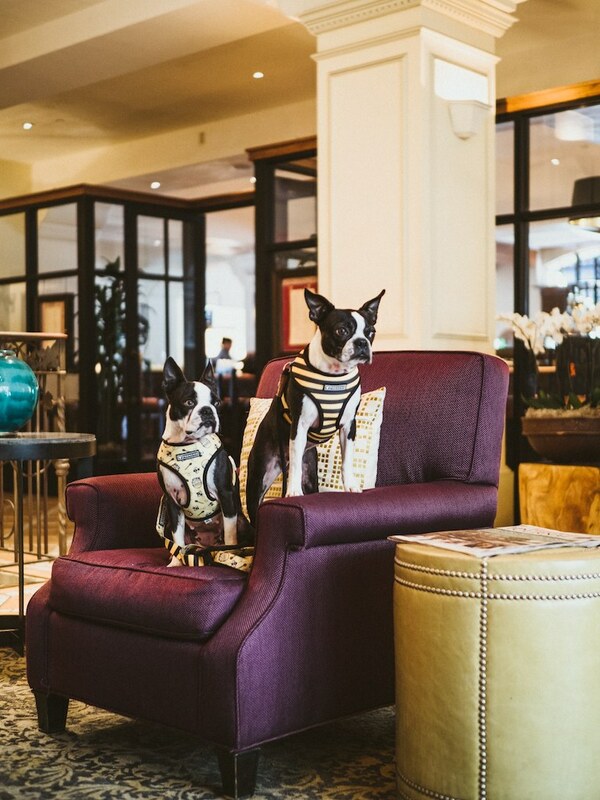 You will find a mix of business and leisure travelers at any Kimpton. 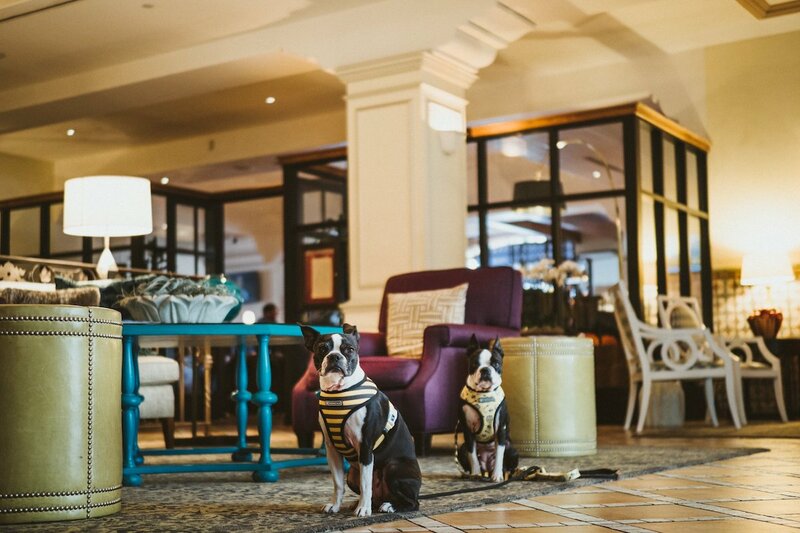 But every evening at all Kimpton Hotels they host a complimentary wine hour. Bill Kimpton understood that people are wired to connect. And what better way to do that than over night. Each property highlights a locally sourced wine and light hors’ doeuvres. Each wine selection will also have the back story with that wine. Stories are the magic ingredient in conversations. During our stay we went down to the lobby to meet other guests. The two dogs Maggie and Orbit were certainly an attraction. We had guests from England come to say hello because they missed their own dog. And another couple on business travel also missing theirs. Spent over an hour chatting with different people. The lobby is warm and inviting with various places to sit. And we only left when we started to get hungry. Our central location made it easy to head back out to State Street. We walked around to window shop before finally selecting a place to eat. Sadly I don’t remember the name of the restaurant. We were casually strolling and found the patio warm and inviting and we had a light dinner snack and drinks and headed back to the hotel. Downtown location – walk to everything. Sense of escape. The hotel in itself is an attraction. The way it’s designed makes you feel like you’re in a different place altogether. Luxurious room and bathroom where details like soft water, instant hot water flow (implies good plumbing), robes, strong wi-fi are appreciated. They truly love dogs. You’ll find the staff coming to say hi and greet you. Nightly wine hour. Meet other traveler and share good conversations. Rooftop pool. 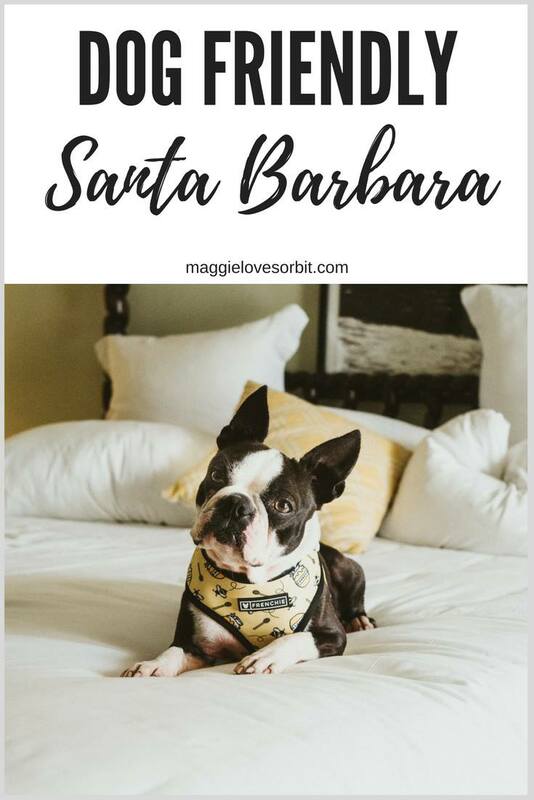 This area is actually not dog friendly but … we went up to take a peek, admire the Santa Barbara views and take a few photos. 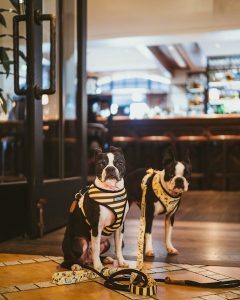 On site restaurant Finch and Fork: Kimpton is known for partnering with a strong local restaurant featuring the best of local cuisine. We were not able to eat at the restaurant this trip but they are well known for their just caught seafood and all natural beef from local farms. Dog’s Bathroom. I was able to find some grassy patches to take the pups to go do their business fairly close to the hotel. As a woman I appreciate this because sometimes I have to take the girls out on my own and I dislike having to walk far to take the dogs to go do their potty after dark. 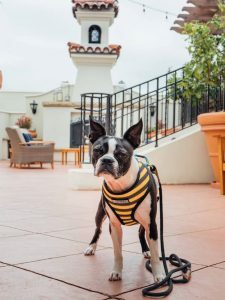 How to Reserve Your Dog Friendly Getaway at the Canary Hotel Always book your room directly with the hotel via their website or calling directly. You will enjoy the lowest rate, best available perks and best value when you do. The hotel’s website can be accessed via this link: CANARY HOTEL WEBSITE And be sure to also look at their Current Hotel Deals when you do. The Funk Zone and shops at the Waterline. An eclectic gathering place that hosts wineries, breweries, restaurants and an artisanal craft collective beneath its wood and steel beams. Visit their website here. Dogs and Beer at the Lama Dog Tap Room. Outdoor seating, craft bear and dogs. That’s enough of a description for me. I love a good cup of joe. 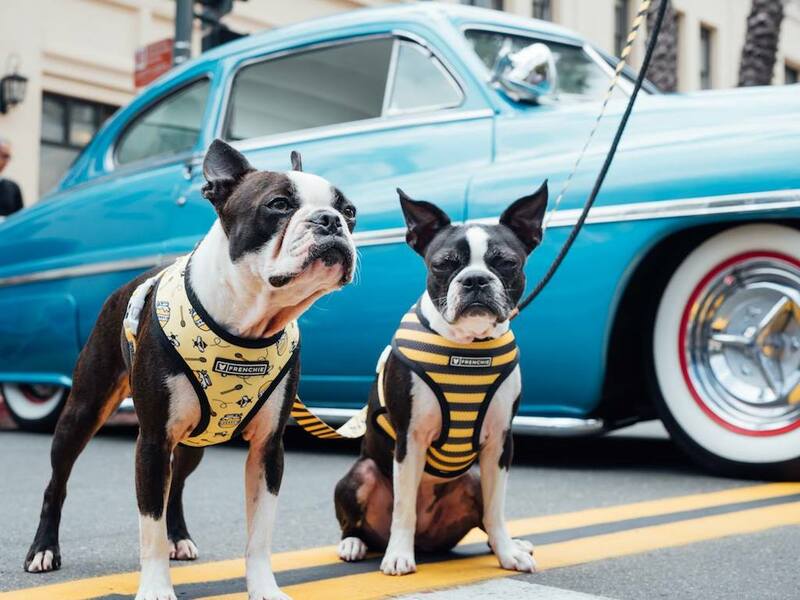 At Handlebar coffee, dogs are welcome. This trendy spot was opened by two former cycling pros and now coffee aficionados. Douglas Family Preserve On a different cross country trip I relied on Bring Fido to tell me where all the off leash dog parks were. I bookmarked the Douglas Family Preserve but we missed it this trip. However based on photos I’ve seen it seems to be an iconic place to take your dog to enjoy the Santa Barbara coastline. A trip to wine country requires a trip to a dog friendly vineyard. In reading the reviews this vineyard welcomes dogs with open arms. Definitely on the list for the next trip. 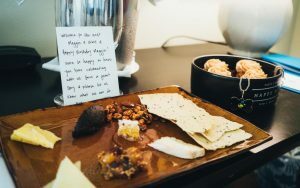 This article was brought to you in collaboration with the Canary Hotel. If you enjoyed this article please share it on your social media or pin it to your Pinterest Board. It’s a lovely location. We parked and never moved the car till we left. I’m sure you would have a wonderful time there.